The human Jaws are smaller compared to our ancient ancestors, thanks in part to our modern diet. As a result of these evolutionary changes, sometimes, there is not enough room in the mouth to accommodate the third molars or ‘wisdom teeth’. When the wisdom teeth are left to emerge into the mouth, the lack of space may cause them to only partially emerge through the gums, cavities may develop and gum infections become a regular problem. Most people develop their wisdom teeth during their teenage years. However, it is not unusual for these teeth to grow correctly, thus causing significant problems for the patient. This uneven growing can be responsible for many of oral health problems such as crowding or damage to the adjacent second molars. An additional problem with wisdom teeth is that they sometimes do not fully erupt through the gum. This is what is known as ‘Impacted Wisdom Teeth.’ When your wisdom teeth only partially emerge, the opening around the teeth can become a fertile ground for harmful bacteria to start growing. This can lead eventually to an infection. As a result of this infection, you will feel discomfort, swelling, pain, and illness. Early removal of wisdom teeth is often recommended to avoid future problems and to avoid costly procedures. With dental exams and x-rays of the mouth, Dr. Paul Hul can determine the position of the wisdom teeth and anticipate if future problems may arise. Regular exams and treatment will also help you keep your gums and teeth strong and healthy, which will prevent costly dental procedures down the road. A tooth is said to become impacted when there is a lack of space in the dental arch, and its growth is affected by gum, bone or another tooth. There are different kinds of impaction. ‘Mesioangular’ impaction occurs when the tooth grows forward towards the front of the mouth. ‘Vertical’ impaction is when the formed wisdom tooth does not fully erupt through the gum. 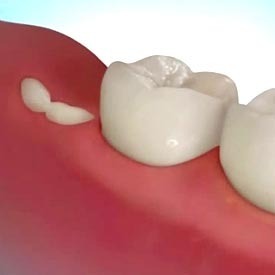 ‘Horizontal’ impaction, which is not as common as the other two-forms of impaction, occurs when the tooth is angled sideways, growing into the roots of the second molar. Impacted wisdom teeth are usually removed because of the problems they are causing or because of the problems that may arise if they remain in the mouth. In many cases, damage caused by wisdom teeth is not visible on the surface. Your Point McKay Dentist will usually take full X-rays of the mouth to see what is going on underneath the gum. This will help them to determine what type of extraction may be required. For all of your wisdom teeth extraction needs in NW Calgary, we welcome you to book an appointment for a consultation today. We can also discuss your wisdom teeth options with you at your next hygiene and check-up appointment — just ask! We look forward to hearing from you soon.